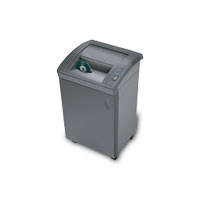 The GBC 2260X Office Shredder - The Shredder has an auto on-off button. EZ-Feed throat. Bag Full shut off. 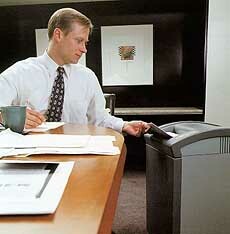 13 gallon shred bin combined with cross cut bulk reduction lets you shred four times longer between bag changes. SmartShred Controls-separate indicator lights for power on, bin full, overload and door open. Easy roll casters. Includes CD/DVD strip-cut slot, plus unique twin-bag design to keep disk shreds and paper shreds seperate.